Samantha Taylor is used to having things go her way. She’s head cheerleader, has all the right friends and a steady stream of boyfriends. But when she tanks the SATs, her automatic assumptions about going to college don’t appear to be so automatic anymore. She determines that her only hope for college admission is to win the election for student body president. Unfortunately, with her razor wit, she’s better suited to dishing out insults than winning votes. When she brashly bets her classmate Logan that she can go two weeks without uttering a single insult, Samantha immediately realizes that she may have bitten off more than she can chew. And when her current boyfriend dumps her, less than three weeks before the prom, it couldn’t be a worse time to be forced to keep her opinions to herself. Finding a new boyfriend will be a challenge now that Logan shadows her every move, hoping to catch her slipping back into her old ways. Samantha is determined to win the election and find a date for the prom, no matter what it takes. After all . 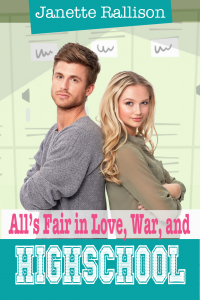 . . all’s fair in love and war (and high school! ).